RomeCasino.com’s new US-friendly software now gets players directly to the action quicker and easier than any other online casino. New on demand game downloading is the fastest in the industry, and unique tabbed games mean players can play several games at once and switch instantly from one to another. Since RomeCasino.com in one of the only online casinos to accept all three major credit cards, the cashier is also quick and easy for both American and European players. RomeCasino.com, popular with European online casino players for some time now, has more than a hundred unique games and state-of-the-art 3D graphics and sound effects. The new US-friendly casino software includes revamped versions of classic and new games including a variety of classic slots, video slots, video poker, roulette, multi-hand blackjack, keno and more. On demand game loading allows for blazing fast download times and gets players to the action faster then ever. Tests show that RomeCasino.com is the fastest loading next generation platform in existence -- almost twice as fast as Playtech casino games and up to four times faster than Microgaming. An added benefit of having such a stable platform is the increased credit card acceptance rate. RomeCasino.com is the one of the only online casinos that accepts deposits through all three major credit cards. Funding accounts is simpler then ever from both sides of the Atlantic. For players that are new to online casino games or who have questions about deposits or withdrawals, 24/7 Instant Chat Support is ready and waiting in the lobby to assist. To celebrate the release of this US-friendly casino software, Rome Casino is offering a 200% deposit bonus. This bonus turns a $100 deposit into $300 for players to wager. 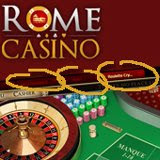 To instantly take advantage of this great offer, the software can be downloaded at http://www.romecasino.com/.